Our friends over at TeamBonding have tons of great tips and suggestions for team building, and we particularly love their recent blog post reminding employees to pay special attention to interns and intern orientation. Interns offer a unique opportunity to evaluate, develop, and, theoretically, hire in-house talent. But while businesses are often busy grooming their interns, they may not realize that interns can use their time in the office to evaluate whether this is a company they’d want to work for in the future. That’s why it’s important for companies to make sure their interns are treated well, and the best way to do that is to get off on the right foot from the very beginning. Intern orientation lays the foundation for the intern experience within the company and it’s critical to make sure you dedicate the necessary time and resources to ensure this is a great event. Check out TeamBonding’s intern orientation checklist and the goals they suggest promoting at your orientation here. And may we suggest incorporating a little team building into the day? This is a large group of people coming together likely for the first time. It’s critical to make sure they get to know one another quickly, and what better way to do that than with a team building activity? It doesn’t have to be a full-feature event like a tour with Museum Hack or an outing to Chelsea Piers, but take a little time to engage in an in-office team building activity to break the ice and get everyone feeling a little bit more comfortable in their company. The NFL offseason is in full swing, but that doesn’t mean one pro team isn’t taking every opportunity to gel off-the-field with the hopes that it just may improve team chemistry on the field. Earlier this month, the Tenneeseean reported that the Tennessee Titans’ organization came together to help mothers and their babies in need of help in the Nashville area. It was the second annual Titan Up for Tots Baby Shower event where players, coaches, front office staff, and even the team’s cheerleaders came together to fill almost 2,000 baby bags with all sorts of necessities for moms and their children. TeamBonding is one of our favorite company’s doing team building for businesses and we love their latest suggestions on turning your office eco-friendly! With Earth Day right around the corner (tomorrow! ), it’s time to focus on how to be a little kinder to the environment, especially at work. We think a focus on going green can be an awesome way to work a little team building into your day-to-day lives at the office without making it feel like a forced bonding activity. Reduce paper waste – We all know to stop printing wherever possible, but TeamBonding says the number one way we waste paper is with paper towels! Make an effort to use just one paper towel each time you wash your hands, and the environment will thank you. Encourage your teammates to do the same! Reduce less plastic – There are numerous ways we use plastic when we don’t have to: water bottles, plates, cutlery, baggies. Invest in reusable products – bring regular forks, spoons, and knives to your desk, pick up a lunchbox, and snag a gorgeous refillable water bottle. If your team uses plastic cups at the water cooler, try to come up with a solution to replace them! Safe Cracker – Safe Cracker comes to you! It’s a mobile escape room with a countdown clock that really encourages team members to feel the pressure and work together. Your team won’t have to travel to experience the benefits of company team building. 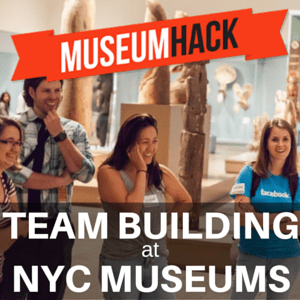 We spend a lot of time here at TeamBuildNYC talking about company team building events. These are all intentional team building activities where a business makes a conscious decision to invest in and reap the rewards of professional team development. We don’t, however, spend a lot of time talking about what happens to the team that’s gone through training when they’re back in the daily grind at the office. A recent blog post at TeamBonding.com got us thinking – there are opportunities for companies to reap the rewards of team building around them. The good folks over at TeamBonding.com were building a new website and by the end of the project, they realized it had been a complete and total team effort – one that wouldn’t have been possible without such a strong, cohesive unit. Wildgoose have announced they have signed a new licensing partnership with TeamBonding. TeamBonding is jetting out to IMEX America, in Las Vegas on October 12-15.